Considering the amount of time we spend in the bathroom, this space is often overlooked when it comes to designing a house. Bathrooms can be categorized as complete bathrooms or as powder rooms. Here, size if an important differentiating factor. The other is the presence of a shower or bathtub. While the former include one of both, powder rooms typically only include a wash basin and toilet. Powder rooms are usually placed near the entrance of a house and used for guests while bathrooms are mostly connected to bedrooms. The most important rule of designing a bathroom is to ensure that the toilet isn’t visible if the bathroom door is left open. Storage is another essential element of bathroom design. Plan for maximum storage and don’t neglect hidden spaces such as the space under the washbasin or above the bathroom door. Ventilation is another important aspect of bathroom design as bathrooms are usually wet and hence prone to mould and fungus. 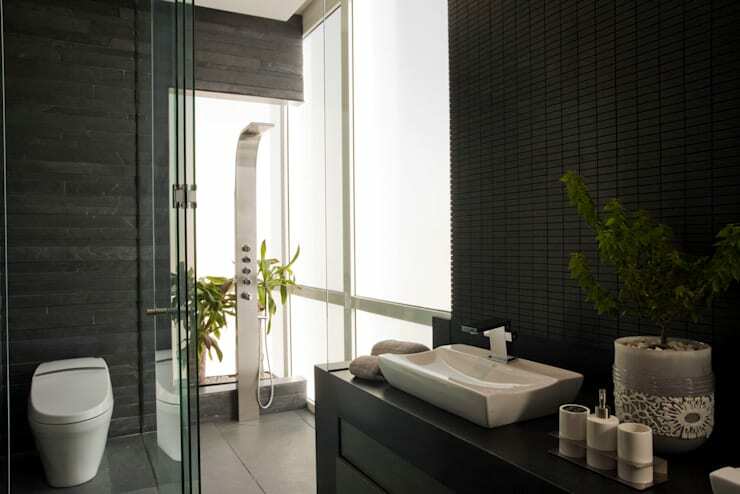 Windows and an exhaust fan are ventilation essentials for bathrooms. Once the basics are dealt with it’s time to make a bathsroom look trendy. Here are six bathroom trends to follow. Bathrooms are rising above being just another room to being a place of relaxation and peace. Choosing the right material for a countertop goes a long way to building that vision. With sustainability becoming a major issue in design, there has been a movement away from synthetic materials towards natural materials. Marble has become of the trendiest materials to use in a bathroom. Heavily veined white marble or earthy shades of travetino marble give bathrooms elegance and natural sophistication. Choosing lighter shades of marble also adds visual space to a bathroom and makes it feel airier. 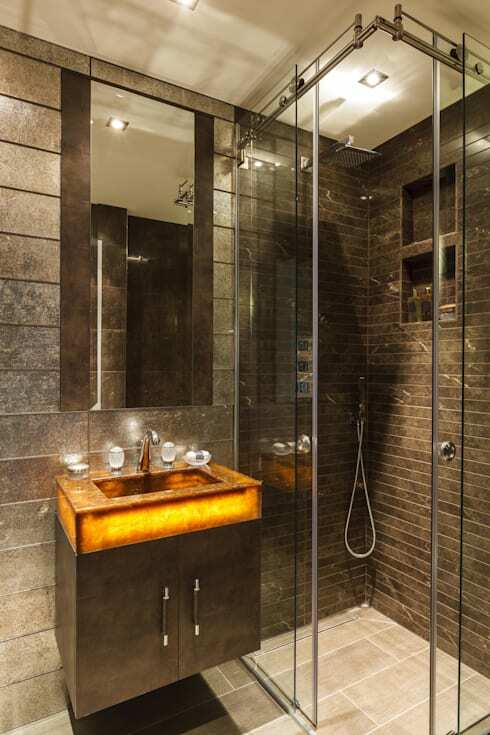 Apart from countertops, marble is also increasingly being used to line shower stall walls. Bathroom sinks can be categorized on the basis of the type of installation they require, material they are made of and shape. Sink shapes can be further broken down as hard shapes and soft shapes. Hard shapes sinks refer to boxy sinks in either a square or rectangular shapes. Soft shaped sinks refer to round, oval or organic freeform shaped sinks. Though soft shaped sinks may take up a little extra space they give a bathroom a trendy, contemporary appearance. Transforming a glass, ceramic or copper bowl to be used as above counter sinks are another way to design a trendy bathroom. 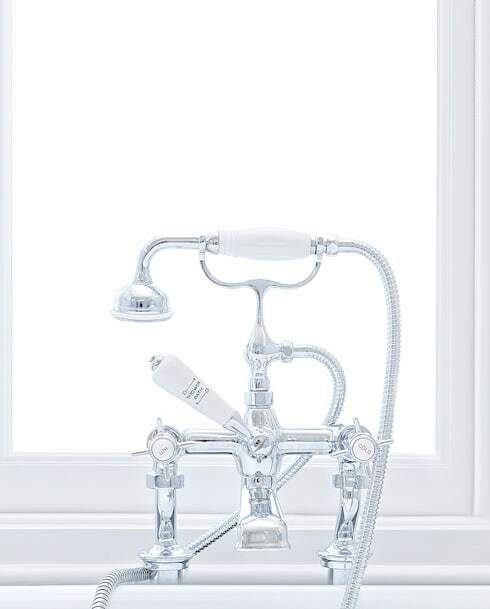 Refreshing faucets is an easy and budget friendly way to update the look of a bathroom and make it look trendy. Choose contemporary sleek faucets with smart user friendly features for a trendy bathroom. Not only should your faucet allow you to adjust the temperature of water it should also be sustainable and allow you to adjust the flow of water. Some taps today also have built in LEDs that are activated by water pressure. Others offer handsfree operation or can be activated by a foot pedal. Ideally, bathroom sinks and taps should be bought together so as to ensure that they suit each other in terms of style and installation. Choosing the right toilet is an important element of trendy bathroom design. Changing the toilet from a regular floor mounted toilet to a wall mounted not only frees up floor space in a bathroom but also makes it look current and trendy. Being wall mounted, these toilets can easily be installed at whatever height you need making them more comfortable to use. This makes them almost a necessity for the elderly and people with limited mobility. Additionally, wall mounted toilets make the bathroom floor easier to clean. 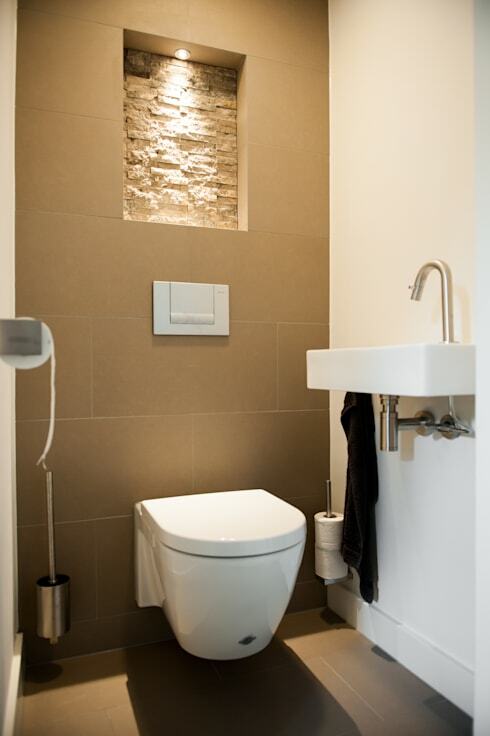 The soft shape of wall mounted toilets complements organic styled sinks to give the bathroom a harmonious appearance. 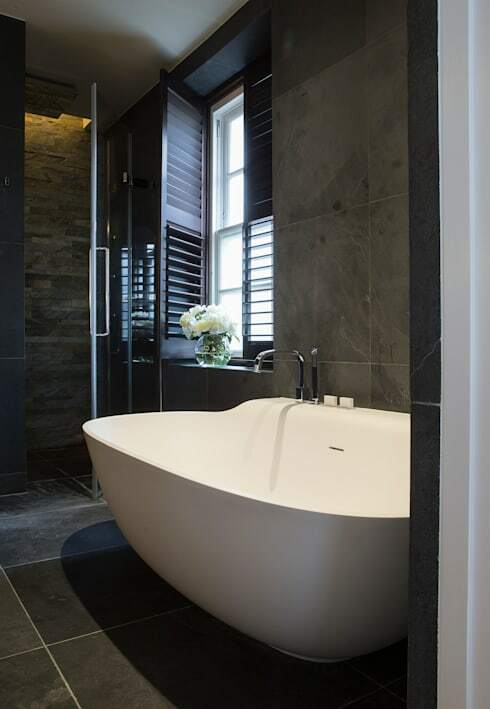 If space allows, a free standing bathtub is a luxury worth indulging in. Bathtubs can be built in or freestanding with the latter being the more trendy choice for bathrooms. While built in bathtubs might seem utilitarian, free standing bathtubs speak of relaxation and comfort. Free standing bathtubs also offer flexibility in terms of where they can be placed and make a strong statement of sophistication and elegance in bathroom spaces. Free standing bathtubs are available in a number of styles varying from classic claw footed tubs to more contemporary forms and materials varying from copper to ceramic. This arrangement is the brainwork of the London-based KSR Architects. Walk in showers or level access showers are symbolic of contemporary bathrooms. Most walk in showers are the same height as the bathroom floor though some may be a level lower. It may or may not be sectioned off with glass walls. Walk in showers are a necessity for people with limited mobility or those who are wheelchair bound. Depending on the shower fixtures this area can also be used as a spa. Walk in showers not only are easier to use but also make the space look and feel bigger. From size and configuration to materials, there a number of ways a walk in shower can be customized to fit in with the size and look of your bathroom. Dress up a walk in shower with hand rails, niches to keep your bathing supplies and a shower seat. Another emerging trend in bathroom design is to include plants as part of the bathroom décor. Not only do plants purify the air, they also add life to a room. 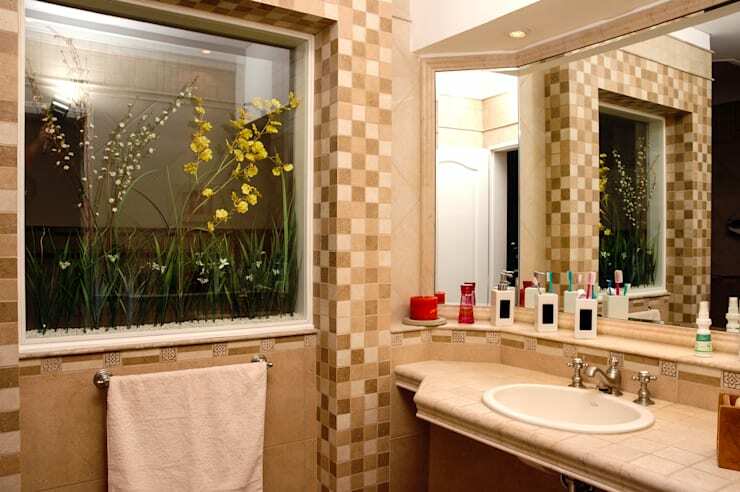 Plants such as the golden pothos are ideal for bathrooms. When planted in water, they need almost no maintenance at all. The sink counter top or bathroom window sills are ideal places to grow a bathroom plant. Lastly choose the right colours to design a trendy bathroom. While black and white are classic colours that never go out of style, shades of beige and brown that were once popular bathroom colour choices are making way for bolder colours. Vivid shades of blue, green, purple and lavender are making their presence felt in contemporary bathrooms. Experiment with floor tiles, bath linen and accessories to show off the fresh colour palette.